Doberman pinschers have the potential to have one of the shiniest coats of any dog. 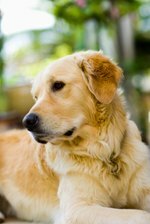 However they do require a little more maintenance than other breeds to keep their skin and coat healthy and properly moisturized. These few steps can make a dramatic difference in the health and appearance of your Doberman's skin and coat. Groom your Doberman by brushing its coat twice a week with a short wire brush or a rubber grooming brush. This will help promote the production of oil, increasing shine. Wash your dog only every few months. Bathing more often may increase the dryness of your Doberman's skin. Due to a Doberman's short coat, they do not require frequent bathing. Use a clean towel to dry. 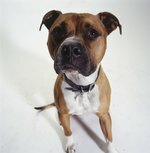 Select a dog food that is formulated for Doberman pinschers. These high-quality dog foods contain nutrients that are needed to keep your Doberman's skin and coat healthy. Supplement your Doberman's regular food with omega-3 and omega-6 fatty acids. These will help maintain a shiny coat. Visit the veterinarian regularly. 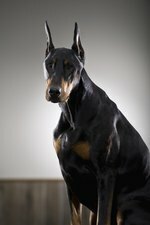 Your vet will be able to determine and treat any other health issues that could be causing skin problems with your Doberman.